La IX edición del Fórum Ausape (Asociación de Usuarios de SAP España) se celebrará en Castelldefels los días 6 y 7 de Junio. Como en ediciones anteriores clientes y partners podrán compartir experiencias sobre las innovaciones tecnológicas en el área de SAP. Este año la agenda del Fórum Ausape se organiza principalmente en torno a cuatro áreas de interés: Cloud, Movilidad, Applications y HANA, en las que se expondrán hasta 19 casos de éxito de distintos sectores. Frank Cohen (presidente de SAP EMEA) y Javier Colado (director general de SAP España) clausurarán la sesión primaria del día 6 de Junio, mientras que Carlos Barrabés (emprendedor en comercio y nuevas tecnologías) será el encargado de realizar la ponencia magistral. Con 400 asistentes en la pasada edición, el Fórum Ausape supone uno de los eventos más importantes del ecosistema SAP a nivel nacional. ConVista estará presente en el fórum a través de un punto de encuentro en el que informaremos a los asistentes sobre la solución que mejor se adapte a su negocio. Para más información sobre el evento, puedes consultar el siguiente enlace. Durante los días 23 y 24 de mayo tendrá lugar el 5º SAP Financial Services Forum en Buenos Aires, el evento más importante de la industria financiera en América Latina. Como en ocasiones anteriores, SAP presentará las últimas tendencias tecnológicas avaladas por importantes clientes que aportarán innovadores casos de éxito, entre los que se encuentran el Commonwealth Bank de Australia o el Standard Bank de Sudáfrica. Tendencias en el sector, desafíos, innovación y estrategia serán los cuatro puntos cardinales sobre los que tratarán las distintas ponencias registradas en la agenda y que estarán impartidas por líderes globales en el sector y consultores de primer nivel. ConVista en su alianza con la empresa de consultoría argentina CDA patrocina este evento, que se celebrará en el Hotel Faena de Buenos Aires. En este enlace podrás consultar la agenda completa del SAP Financial Services Forum en Buenos Aires. IT solutions need to respond to these requirements, dealing with increasing data volume caused by a higher grade of granularity. In addition to that, the data must often be available in real time to respond quickly to critical decisions. It is therefore fundamental to centralize data, aiming to avoid duplications and guarantee data quality and integration in data processing. So let’s have a look at Basel first. 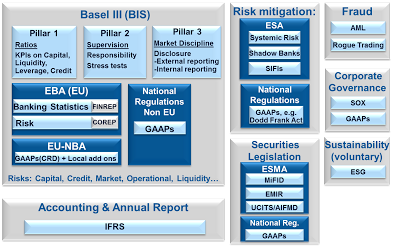 The European Banking Authority (EBA) is introducing EU-wide uniform reporting procedure based on the Capital Requirements Regulation (CRR) and the Capital Requirements Directive (CRD IV), coming into force in all EU member states Since Basel III is based on Basel II architecture, the latter will automatically be included in the solution; therefore, we will only focus on Basel III hereinafter. 3) The disclosure management of the results to the respective authorities (Pillar 3). For Reporting and management purposes, the SAP Enterprise Risk Reporting 1 and 2/HANA come into place. Presentation to authorities (EBA, NBAs) can be covered by the SAP Disclosure Management solution (including new xbrl standards). 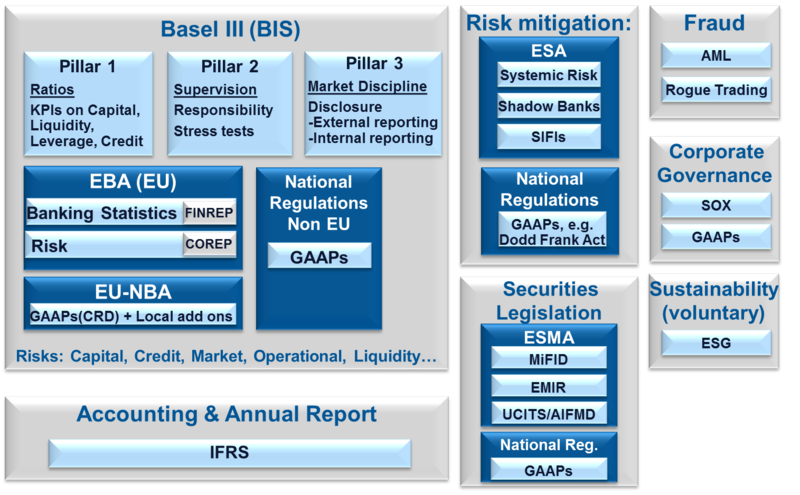 In Europe, the analytical reporting regarding risk for Basel III is defined by the “COREP” reports. They are covered by SAP Analytical Banking. For external presentation (XBRL format) of the data, the Disclosure Management solution comes into place. However, disclosure not only implies risk analysis (see above), but also statistics on Balance Sheets and Profit and Loss positions (new!). The reports, within the EU defined by “FINREP”, can also be presented by the Disclosure Management solution. They would fall into the Finance category, and are based on IFRS reporting. In contrast to COREP, the calculation process is not running on the Analytical Banking application from the Bank Analyzer, but its AFI (Accounting for Financial Instruments) component. AFI can also be used for IFRS reporting. 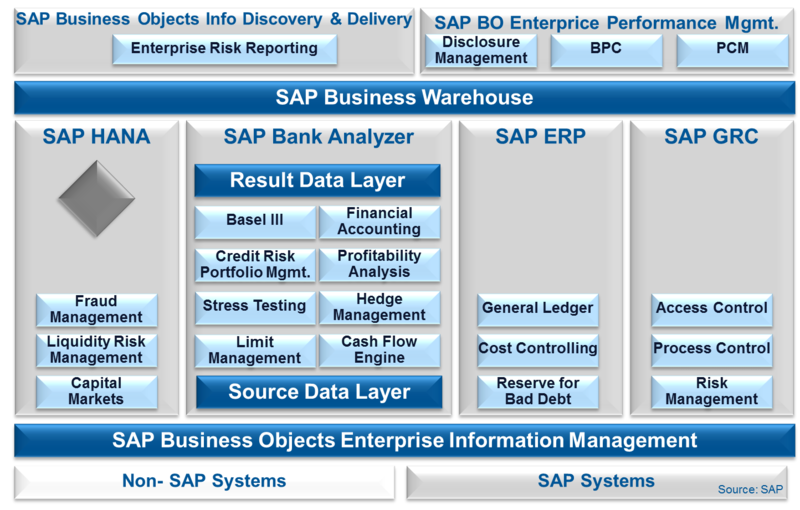 An alternative to the Bank Analyzer is SAP ECC/FI. 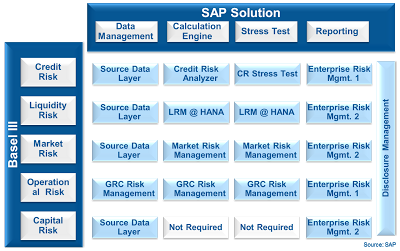 Fraud and Governance/Compliance are dealt with within the SAP GRC solution (Governance, Risk & Compliance). 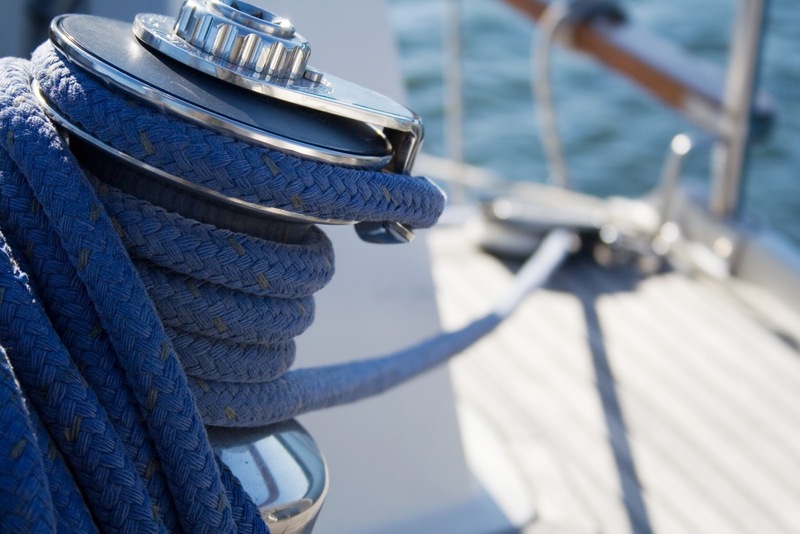 Varouis regulations, such as SOX or Euro-SOX, demand an internal control system to be in place. SAP Process Control enables the management of such a system in almost every aspect, for example policy management or monitoring of manual controls. As far as Fraud is concerned, Banks have to deal with a wide range of different types of issues. One big block which has gained high importance is Anti-Money Laundering policies, requiring for instantaneous action. SAP Fraud Management, also based on HANA, assures fraud prevention, detection, investigation, as well as its monitoring. It is categorized as a piece of the SAP GRC package. High data volumes can be organized and analyzed efficiently. Fraudulent behavior related to internal actions (e.g. 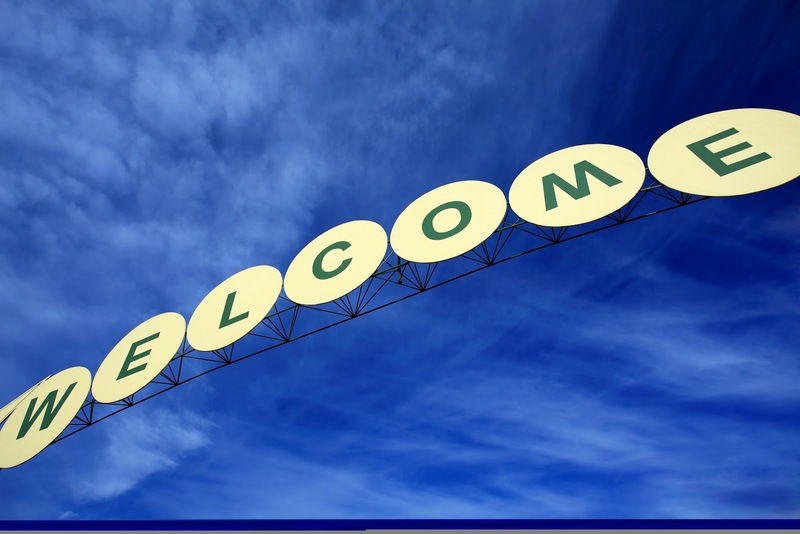 Rogue Trading, Wire Transfer Fraud, or Fraudulent Loans) can also be managed by the SAP solution. Corporative Governance, regulated by Sarbanes–Oxley in the US and by a “EuroSOX” version in Europe is related to fraudulent behavior and therefore also part of SAP GRC. For reliable management of authorizations, SAP Access Control ensures compliant user provisioning as well as the compliant design of user roles and access risk analysis on various levels. Furthermore, it enables an audit-proof emergency access management. As far as securities are concerned, different topics are to be addressed. Within European regulation, they are regulated by ESMA, which has defined the European Market Infrastructure Regulation (EMIR) as well as the Markets in Financial Instruments Directive (MiFID) and the Undertakings for Collective Investment in Transferable Securities (UCITS)/ Alternative Investment Fund Managers (AIFMD, not yet in force) In the US, these securities topics are covered within the Dodd Frank Act. As far as EMIR is concerned, you can take advantage of the SAP TRM (Treasury & Risk Management) solution to deal with Central Counterparties for clearing operations. 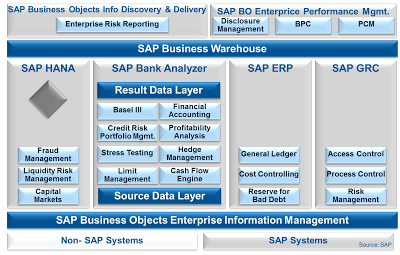 SAP is furthermore currently developing a tool for the upcoming reporting obligation (“Transaction Register”) for EMIR. If you are a depository bank and need control Investment Banks’ products, you will have to calculate the commissions and the Net Asset Value (NAV) respectively. 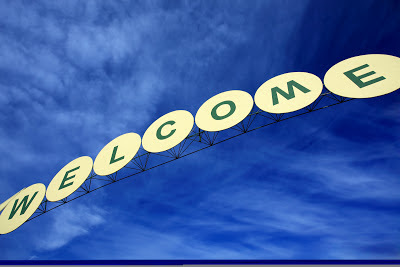 ConVista has developed a proper tool which will automate that process for you. If you would like to stress environmental sustainability, SAP EHS (Environment, Health & Safety) will be an appropriate solution. It allows tracking, measuring, and monitoring emissions, and is also able to generate reports for regulatory requirements. Finally, for social compliance, a sustainable workforce needs to be assured. This can be achieved by deploying SAP ERP HCM (Human Capital Management). Having analyzed one by one the pile of regulations, we need to keep in mind that the above picture will for sure be a snapshot in time only. Further requirements are just around the corner and existing ones are very likely to be improved. However, despite all the complexity behind it, we could see that the technological solutions are available and actually not that complicated. In the end, it comes down to a selection of products which can indeed be used for several purposes (e.g., GRC for Basel, Fraud, and Sustainability).